Producer sentiment inched higher during April as the Ag Economy Barometer increased to 130. 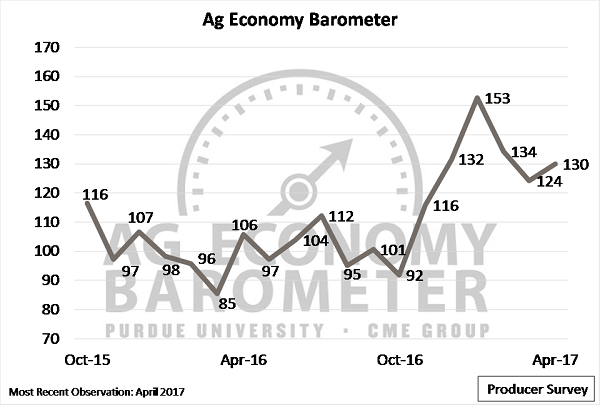 The latest result for the Purdue/CME Group Ag Economy Barometer, which is based on a monthly survey of 400 U.S. agricultural producers, was slightly higher than March's 124 reading, but still well below January's peak of 153 (Figure 1). When compared to a year earlier, sentiment among producers was much improved, up 23 percent in April 2017 from the April 2016 reading of 106. More broadly, agricultural producers' sentiment since December 2016 has been notably more positive than at any other time since data collection began in October 2015. Figure 1. Purdue/CME Group Ag Economy Barometer. October 2015 to April 2017. The barometer's two sub-indices, the Index of Current Conditions and Index of Future Expectations, both turned higher in April. Although the measure of producers' forward-looking expectations - the Index of Future Expectations - is still notably lower than its January 2017 peak, the Index of Current Conditions has been trending upward since August 2016 (Figure 2). In fact, the Index of Current Conditions reached a survey high of 127 in April, topping its previous high of 125, which was set in December 2015. Figure 2. 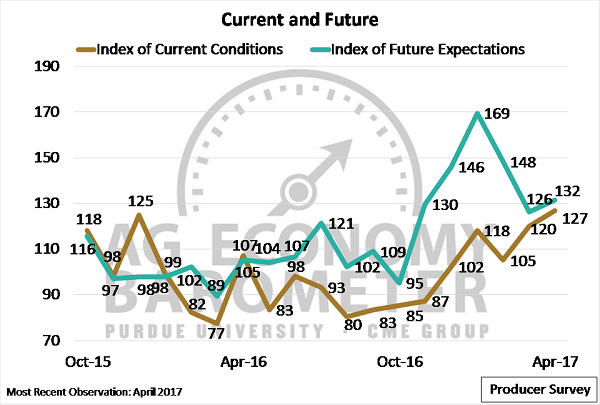 Index of Current Conditions and Index of Future Expectations, October 2015 to April 2017. On the April survey, producers were queried regarding their expectations for commodity prices over the next year. When asked if they thought soybean prices would be higher, lower, or about the same in 12 months, a pessimistic shift was observed compared to a year earlier. While the majority of respondents (54 percent) expected prices to be "about the same" 12 months ahead, more respondents expected "lower" soybean prices (27 percent) than "higher" soybean prices (17 percent). This is quite different from a year earlier as the share of respondents expecting "lower" prices in the April 2017 survey was more than double the percentage of respondents expecting lower prices in the April 2016 survey (13 percent). Figure 3. 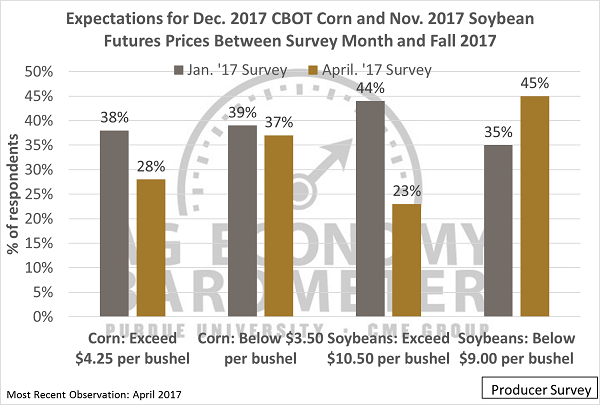 Expectations for December 2017 CBOT corn and November 2017 soybean futures prices between survey month and fall 2017. While producer sentiment has improved significantly since last fall, another measure of confidence - the willingness to make large capital investments - has changed less over that same period. Each month the survey poses the question, "Thinking about large farm investments - like buildings and machinery - generally speaking, do you think now is a good time or bad time to buy such items?" The willingness to commit to large capital expenditures might be interpreted as a measure of producers' long-run confidence that their business will be profitable. Examining survey results back to October 2015, producer response to this question has been remarkably constant. Over the life of the survey, the range of respondents indicating it was a bad time for large farm investments ranged from a low of 60 percent (December 2015) to a high of 78 percent (March 2016). However, since April 2016, this figure has been in a 10-point range of 63 to 73 percent. Since November 2016, when the barometer readings started increasing, this sentiment gauge has improved from a reading of 73 in October 2016 to 65 in April 2017 (Figure 4). The improvement parallels the change in the barometer, but suggests that the shift in buying/investment behavior is more muted than the change in overall sentiment measured by the barometer. Figure 4. 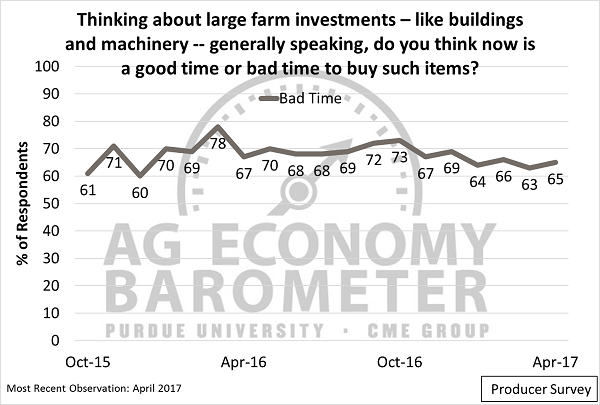 Share of producers reporting it's a "bad time" to buy large farm investments, such as buildings and machinery. October 2015 to April 2017. A second question about machinery regularly included on the survey focuses on producers' perceptions regarding used farm machinery prices. This question, which is posed on a quarterly basis, reveals that a majority of producers have consistently rated used farm machinery prices as "high" (a rating of 6 to 9 on a 9-point Likert Scale). In recent months, there has been a slight increase in the share of respondents rating prices as low (a rating of 1-4). 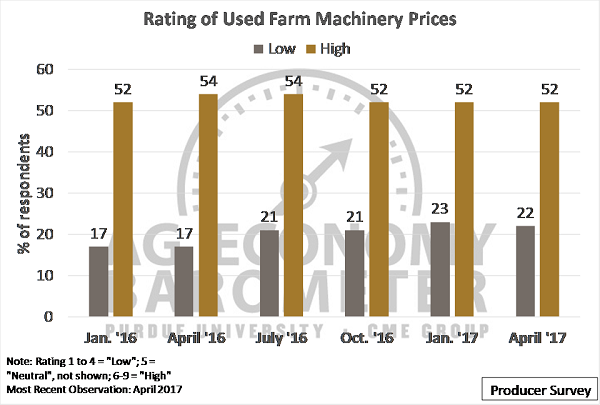 However, compared to a year earlier, the April 2017 survey results indicate that more producers think used machinery prices are low and fewer producers think used machinery values are high. Finally, the April survey featured a new question that asked producers' expectation for used farm machinery prices over the upcoming 12 months (Figure 5). While the majority (61 percent) expected prices to remain "about the same," a larger share of respondents expected higher prices (24 percent) than expected lower prices (16 percent) in 12 months. Figure 5. Share of producers rating used farm machinery price as low and high, January 2016 to April 2017. In parallel to the producer survey, a quarterly survey of 100 agricultural thought leaders is also conducted. The agricultural thought leader group is comprised of agribusiness executives, agricultural lenders, commodity and farm organization leaders, as well as agricultural economists in the academic and government sectors. Expectations regarding the farm economy's health among the thought-leader group increased by about 12 percent in April compared to the previous survey conducted in January (Figure 6). Similar to the results from the producer-driven Ag Economy Barometer Index, agricultural thought leaders' sentiment in early 2017 is much more positive than last fall. Figure 6. 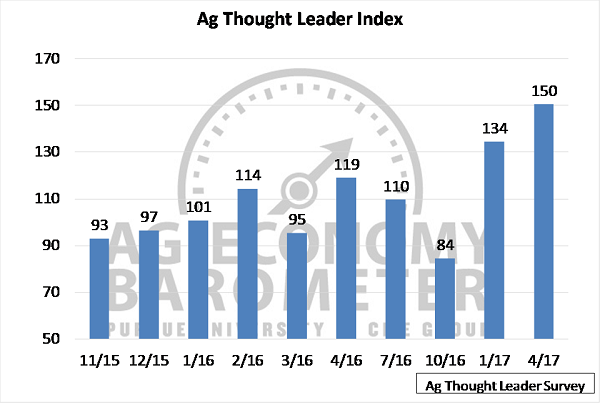 Ag Thought Leader Index, November 2015 to April 2017. Figure 7. 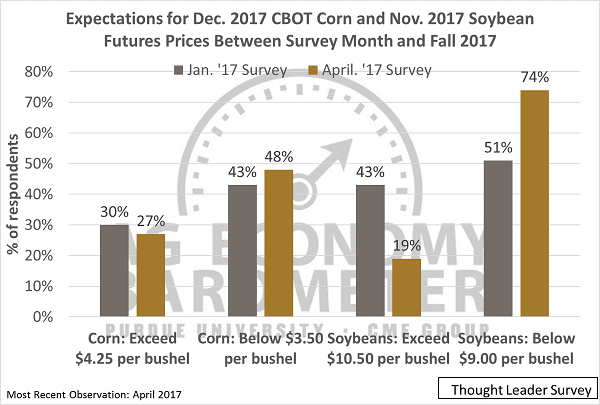 Ag thought leader expectations for December 2017 CBOT corn and November 2017 soybean futures prices between survey month and fall 2017.